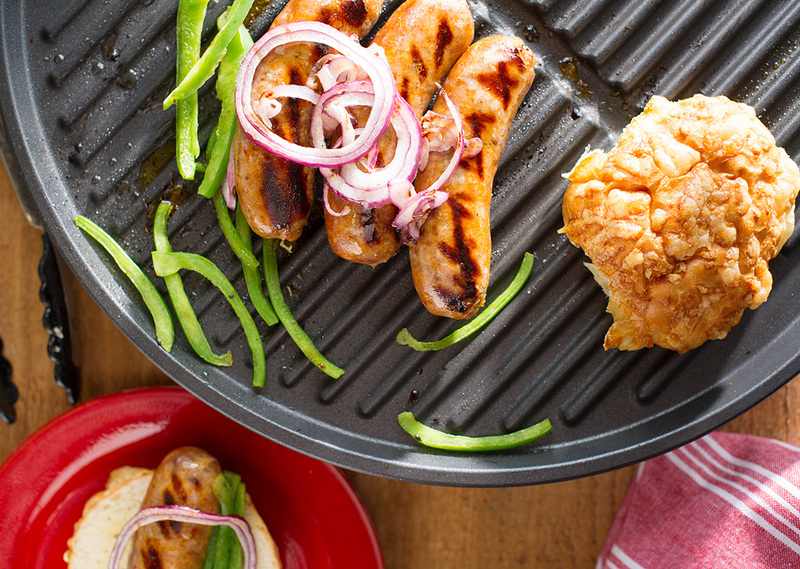 Sprinkle low-fat Italian sausages with garlic, Italian seasoning and pepper and grill with tomato, green pepper and onion for a delicious new meal to try this week. Pair with coleslaw, potato salad or your favorite sandwich side. In a small bowl, combine the garlic, Italian seasoning and pepper; sprinkle the mixture over sausages and vegetables. Arrange the sausages horizontally on a preheated grill and place the tomato, green pepper and onion around the links. Grill for 6 minutes, or until a meat thermometer inserted into center of the sausage registers 160° F.
Spread mayonnaise on the bottom of each bun and add the sausage and vegetable mixture. Top with remaining half of bun. For the Evolve grill preheat to 350° and place all ingredients on the grill for 4-6 minutes. For the Indoor/Outdoor Grill, set grill to preheat at Setting 4 and place ingredients on the grill and cook for 5-7 minutes while covered.